So yesterday I sat down and watched Dragon Ball Super. It’s a continuation of the Dragon Ball (GT never happened) series. It seems silly to compare the two series, but Sailor Moon and Dragon Ball are like siblings. I grew up watching both series on Toonami in the 90s and early 2000s. During my whole watch of DBS my excitement never left. The first episode was a great way to ease the viewer back into the series. It made me laugh from the beginning to the end. It was prefect to start with a light hearted episode because the DB series can be the most cheesiest thing ever. Judging by the preview of episode two we’re in store for more cheesyness. Vegeta on a cho cho train? God next episode will be a blast. As for Sailor Moon Crystal. During first episode I was excited to see it, but as I watched it I was left with nothing. The only true excitement I felt was watching the Moon Pride video and episode five. Of course seeing the Generals in action. Well DBS is something new while SMC is something old. DBS is picking up where the series left off in DBZ. While SMC is a retelling of the manga storyline. To be honest it’s pretty boring to watch. I stopped watching SMC around the episode where the gang learns about Chibiusa. Why? Because I don’t need to relearn that Chibiusa is a daughter of Usagi and Mamoru. I haven’t picked up Crystal since. Plus it’s a 20 year old manga. The storytelling is very outdated. I mostly sat there pointing out the plotholes as I watched the episodes. Now no story is prefect, but the SM manga has very noticeable plotholes. Now not all anime who follow closing to the manga is bad. Fullmetal Alchemist Brotherhood is great example. It worked because FMA has a better pace and fleshed out characters compare to Sailor Moon. Plus the manga was still going when Brotherhood was made. Crystal should have been what Super is. A new story set in the SM universe. I was never big into the Dragonball franchise, but I'm glad its fans are getting something new. I'm also surprised it's happened so fast, it seems like just last month the Powers-that-Be announced DBS was even going to be happening. Another factor for both SMC and DBS is creator control - Naoko Takeuchi seems to be notorious among industry folk for being controlling, an animated work that mimics her comics might have been what she always wanted? She might not have wanted new material she didn't write herself to be made. Meanwhile, Akira Toriyama, is pretty laid back comparatively, he's no pushover, but he seems pretty open to whatever (I mean, he did allow Dragonball Evolution to be made and released) as long as he gets a cut of the profit. Also, Dragonball Z Kai has already proven to broadcasters that it still sells while SMC was almost a bit of an experiment. 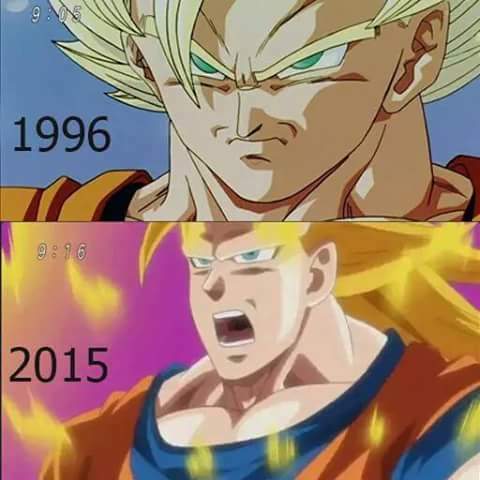 Well for starters, Toei has been reviving franchises of the 90's to see what sells. Saint Seiya-Soul of Gold and SMC were pretty much market experiments as stated by Bunny, since they didn't know if they would still sell. Well, Toei had been planning to revive the franchise ever since the first modern movie "The battle of the gods" Dialogue in the same movie and some dropped comments lead to rumors that Toriyama was working on another series and eventually brought to Resurrection F and DBS, the series was made with fan requests asking to see the warriors' daily lives and leisue time, Akira himself has been writing and that's why we have the super series. The Crystal Comparisons aren't so silly anymore. Toei has made a lot of people very upset with the horrendous animation in the 5th episode of Super. I could forgive the animation if it weren't for one thing. Super is doing a complete adaptation of the Battle of Gods movie. First of all: WHY? and second all, couldn't they at least re-use the movie's animation? It would be lazy but at least it'd look better than this. I'll take that over stuff in Crystal. At least DBS has better motion than Crystal. Like 98% of time the characters barely moved in Crystal. I swear to god I was watching a poorly made visual novel. I don't nitpick much on the animation, since the overall appearance is fine. because I love both stories.